James "Logan" Howlett, better known as Wolverine, is the most iconic character in Marvel’s superhero team the X-Men, and possibly in Marvel comics as a whole. He’s pretty much the leader of the X-Men, if you ignore Scott “Prettyboy-I-Mean-Cyclops” Summers, which you should. (Ooh! Shots Energy beams fired.) What this means is that Wolverine has always been a popular choice when it comes to Halloween costumes. There’s nothing wrong with standard Wolverine costumes, but sometimes it’s fun to set yourself apart, and you can do so with a set of DIY Wolverine claws and a custom hairstyle, or even by designing your own Wolverine cosplay based on his more obscure appearances in comics and movies. Wolverine’s claws are his most recognizable feature, apart from his hair (which we’ll get to, of course). We have Wolverine Claws gloves, but sometimes you feel like making your own, you know? We love this how-to on making great-looking claws using cardboard or mounting board, wooden chopsticks, hot glue, and silver spray paint. The only downside of these vs gloves is that your hand is partially filled with the cross-pieces that keep the claws together, so it may be difficult to hold your Trick or Treat bag or drink at the same time. 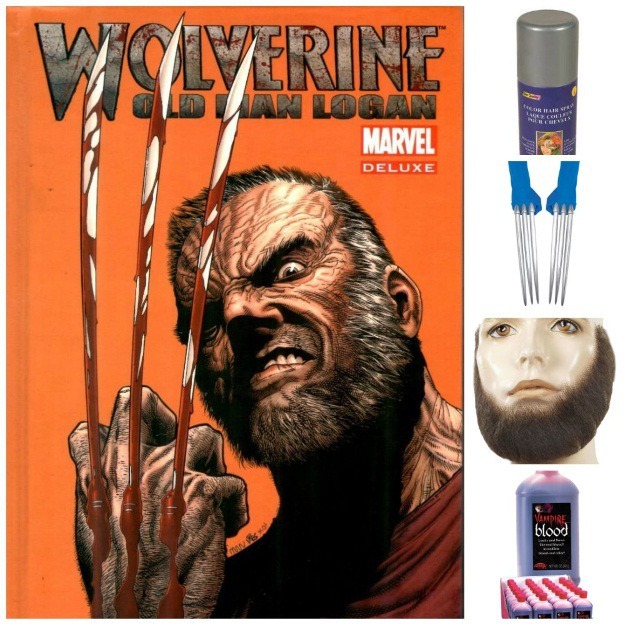 Wolverine’s hair and beard aren’t difficult to do, you just need enough hair to pull it off. And, of course, having dark hair helps. If you’re golden-haired or insufficiently em-bearded, you might need to add some black hairspray or a wig and beard set to your Halloween shopping list. But as the above images show, Hugh Jackman pulled it off with a variety of hair lengths and colors, and he, like, is Wolverine. So how do you get Wolverine hair? Sweep the hair at your temples back and up, and the hair on top forwards. Mousse and/or hairspray helps, maybe even both. If you're wondering how to make a fake Wolverine beard, trim your mustache and top of your chin (if applicable). Look at the photos for guidance, it’s not rocket surgery. The mutton chops are a little more difficult but they're still do-able. Wolverine facial hair is a thing. Okay, so what if you decide the DIY route isn’t for you? What if you really just want to buy a costume and have someone else–that means us–do all the work for you? Hey, there’s no shame in that. And don’t worry, we’ve got your back, whether you’re interested in a more traditional look from Wolverine’s costume evolution or something a bit…different. Take a look at these three alternate Wolverine costume ideas below. Old Man Logan was an eight-issue series running from 2008 to 2009, which was recently rebooted in 2015. In this post-apocalyptic world of Earth-807128, supervillains run the United States and superheroes are either dead or in hiding. Logan is an old man–hence the title–who gets drawn back into his (previous) life as Wolverine. Wolverine's beard is short and bushy, and he’s well into his silver years. If you’re no silver fox or naturally hirsute, we recommend some hairspray and a fake beard. Logan still has his claws, of course, but his hands bleed whenever they’re used, so be sure to pick up some fake blood. In the first Civil War crossover series in 2006-2007, Nitro burned Wolverine down to his adamantium skeleton. Wolverine was similarly incinerated by a Sentinal in the 1981 Days of Future Past storyline. 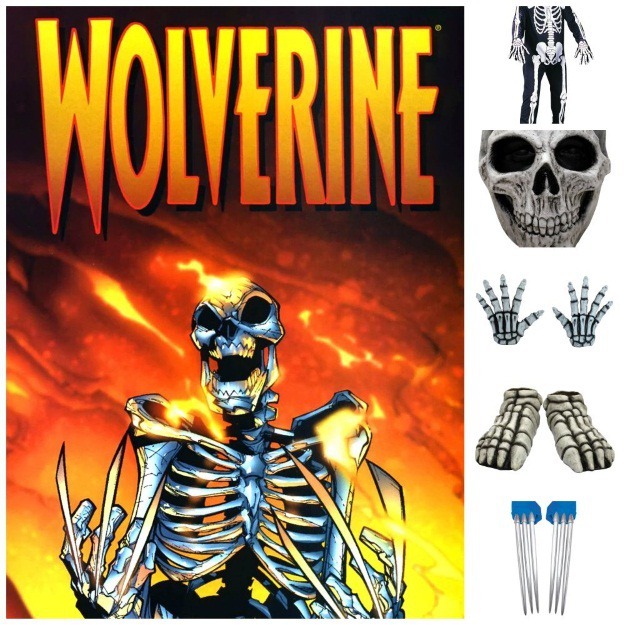 Of course, it’s only a matter of time before he regenerates, but a fun costume or Cosplay idea is Wolverine as a skeleton. You can accomplish this look with a basic skeleton costume and claws. It can be difficult holding DIY claws with skeletal gloves, so we recommend wearing our Wolverine Claws underneath the Skeleton Hands, with holes cut in the gloves for the claws to stick out from. Let’s face it, X-Men Origins: Wolverine was not a great film. The twists in his origin story, like having him fight in the American Civil War, were strange choices. (Especially since he’s Canadian!) But seeing Logan as a lumberjack was so ridiculous yet somehow so appropriate. (Probably because he’s Canadian!) Keeping in mind that sometimes the most obscure costumes are the most brilliant, Lumberjack Logan may just be our favorite alternate Wolverine idea. It's also a fun and easy Wolverine cosplay! The base costume is the lumberjack. 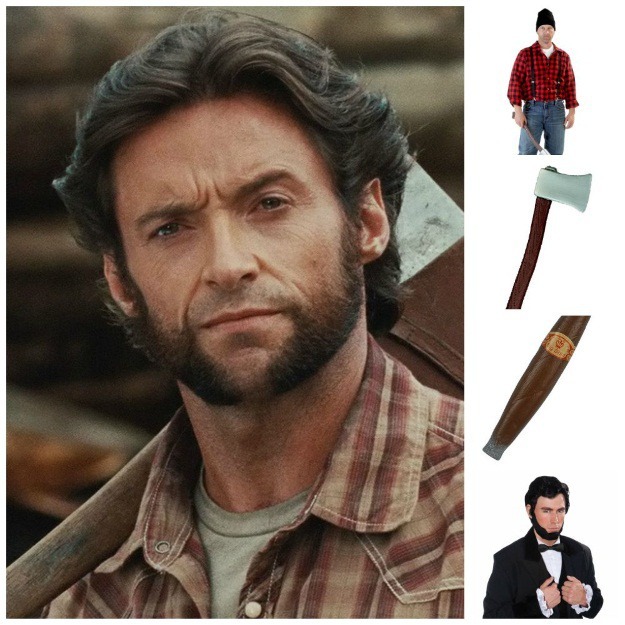 Logan has his trademark beard and a shaggier hairstyle, similar to our Abraham Lincoln wig. Don’t forget the cigar and ax, though. The claws are optional, but it’s Wolverine so of course you’ll want them. What did you think? Have you tried to DIY Wolverine before? Do you have a favorite alternate Wolverine outfit? Let us know in the comments below, and check out our range of Wolverine costumes if you need any more inspiration!